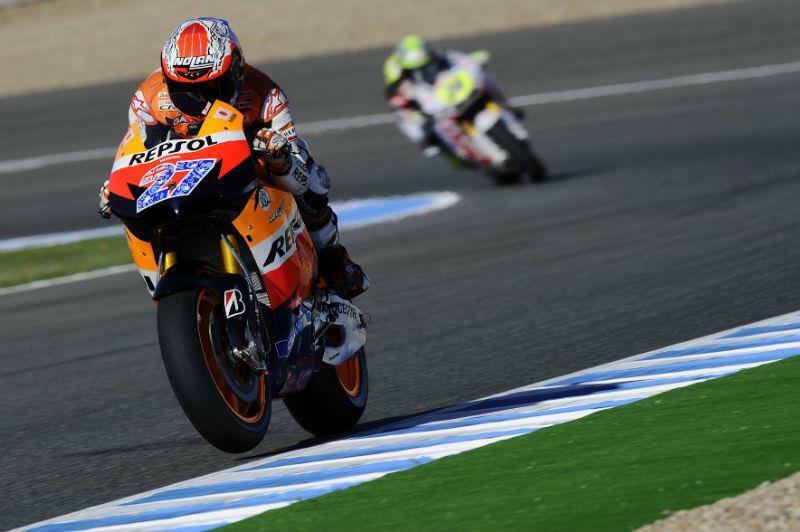 Repsol Honda rider Casey Stoner has continued his dominance of the 2011 MotoGP season with pole position at Jerez. The Aussie took pole position within the last moments of the session before dropping his bike in the gravel at turn one. Team-mate Dani Pedrosa was unable to better Stoner's time despite several very close laps at the end of the session. Pedrosa will start from second on the grid. Champion Jorge Lorenzo will start from third on the grid after holding pole position for the majority of the session. Team-mate Ben Spies will head the second row in fourth. Valentino Rossi continued to struggle on the Ducati and could ony manage to post the 12th fastest time after crashing at turn eight only 10 minutes into the session. Tech 3 Yamaha rider Cal Crutchlow will start from ninth on the grid behind team-mate Colin Edwards in eighth.